Have you noticed a crack in a wall of your Lancaster, NY home? Whether it is just a few inches or a couple of feet, a crack, no matter the size, can potentially lead to thousands of dollars of repairs. In the absolute worst case, a crack left unrepaired can result in a home eventually becoming unlivable. The best way to protect your home and your bank account is to get wall crack repair services from Utech Waterproofing the moment you identify even the slightest damage. Our contractors will quickly protect your home, at a fair price. 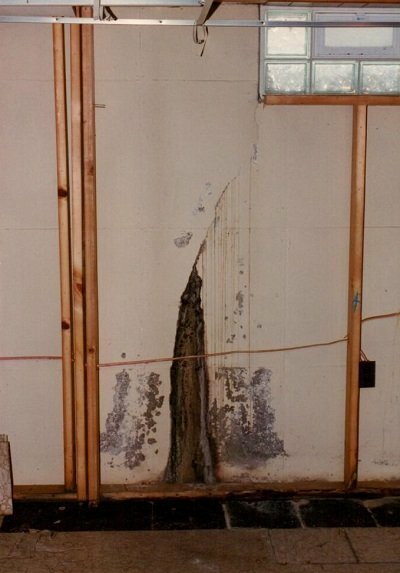 Cracks in the wall or foundation of your home can be caused by a variety of factors. The most common factor is water damage. Water flowing through or behind your walls will wear away at them. Cracks are usually the first sign of potentially greater damage. If nothing is done the cracks will grow until your home potentially becomes unstable. Water isn't the only cause of cracks. Cracks can also be caused by factors like tree roots growing into your walls or even shoddy construction. The source of the damage may be different, but the need for wall crack repair services remains the same, and thankfully Utech Waterproofing has the experience to resolve any problem. Utech Waterproofing uses a number of proven methods to restore walls and foundations quickly and effectively. When viable, our first option is our exclusive Inject-A-Seal waterproofing process. This process seals concrete walls at the source, both repairing the damage and preventing future damage. For light damage that isn't likely to repeat, especially on interior walls, we also often use adhesive polymers. For specific types of damage, this treatment lasts roughly a decade. For truly extensive damage, we may have to redo your foundation. When that is the only option, our technical staff are skilled with installing 'dry pack' mortar, jacks, wall braces, and anchors. A crack left unrepaired could lead to the loss of your home. If you need wall crack repair services in Lancaster, NY, contact us immediately or give us a call at 716-893-8801 for the best wall crack contractor in the area.